In the ever-crowded blogging world, it’s challenging to stand out. 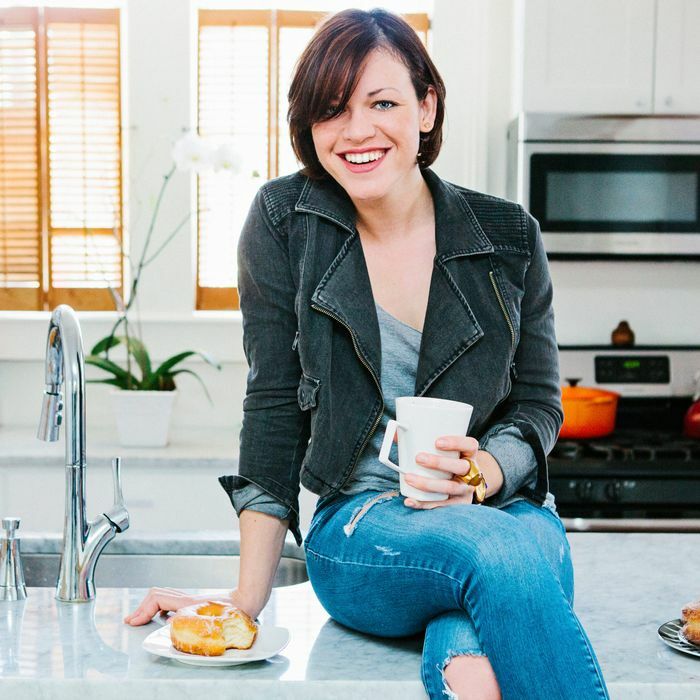 Joy “the Baker” Wilson has done just that since she started her site in 2008: She’s a self-taught home cook who’s completely obsessed with sweets, and her witty, playful writing has translated to two cookbooks, with a third on the way. Wilson recently moved from Los Angeles to New Orleans, which she calls the “best culture shock ever,” and she’s soaking up the spirit and the food culture of her new home. This week, she split her time between the two cities, eating bacon-and-fried-oyster sandwiches in NOLA and two orders of In-N-Out fries back in California. I’m determined to eat every single grapefruit in the state of Louisiana, so I make myself a glass of fresh grapefruit juice from two grapefruits that live in a giant, slumped-over produce bag I hide behind my kitchen door. I follow the juice with a giant glass of water, knowing that I’ll probably forget to drink water again until evening. I quickstep into making myself a pot of coffee before realizing that I’m late for a meeting and my hair is unfit for public viewing. Before rushing out the door I splash (accidentally frozen) almond milk into a mug, pour coffee over it, hope it thaws, chug the coffee, and remind myself to adjust my refrigerator temperature later. And on my way to my meeting, I stop for the best doughnuts in town, District Donuts. Tardiness is so quickly forgiven where doughnuts are involved. My meeting is with a photographer friend and another food-blogger friend. We stand around plotting a winter holiday pitch for a magazine, work our way through the pile of doughnuts, drink hot-turned-lukewarm coffee, and use our fingers to pick bites off of a tray of roasted cabbage and carrots. Is it tacky to bring doughnuts to a friend’s house and then sneak off with a few as you leave? Because that’s what I did. At home, behind on emails and hungry, I heat the previously neglected pot of coffee and eat another half a doughnut while I heat up a very beige pouch of white-bean-and-farro soup. How exciting is beige soup after glazed donuts? Not. I gussy up my soup with olive oil, smoked sea salt, smoky paprika, and most of the Parmesan cheese in my fridge. Done. It’s carnival season in New Orleans, which means every single person that I’ve known over the last few years is in town and ready to celebrate. My friends, in from Seattle, and I head over to Cane & Table for dinner. My favorite bartender always makes me too many fresh daiquiris, so I guzzle a glass of unsweetened cranberry juice and water before heading to dinner. Dinner is a maze of fried ribs, spoon-bread with chicken butter, swordfish curry, and (as predicted) daiquiris. My friends grab go-cups filled with ice from Cane and Table and head outside, where they pour gin — just gin — into their cups. Well, okay then! I skip the gin, drop them off at Laffite’s Piano Bar, and head home to drink tea and measure out ingredients for brown-butter muffins. My alarm goes off at 5:45 a.m. (totally not normal or encouraged), and I give myself 15 minutes to heave myself out of bed and preheat the oven. It’s my friend Gabrielle’s birthday, and I’m going to surprise her with warm morning muffins. In the kitchen, I whisk together last night’s pre-measured ingredients for my brown-butter-blackberry-orange muffins. Anything baked and warm from the oven will do for a birthday surprise and, really, it’s just a relief to bake something and not have to photograph it for my site. I find that between writing cookbooks and shooting recipes for the blog, I feel like I’m always cooking — which I love, but it takes so much longer when you’re photographing a recipe step-by-step. It’s nice to make something without styling your kitchen counter or standing on a chair with a camera, like a normal person! Gabrielle makes me the milkiest latte, which I savor at her kitchen counter. I taste half a muffin, do a birthday dance, and hustle my way to the grocery store. I need to make brunch for last night’s gin-loving friends. I’m living in a crazy apartment in the French Quarter for just a while longer, and I want to have as many people as possible over to enjoy it before I move. Also … I never need an excuse to brunch. I make a pot of coffee that I pretend is going to be for my brunch guests, though I know I’ll drink more than several cups before they arrive: dark coffee barely lightened with a splash of almond milk (it’s not frozen anymore). When my Seattle brunch friends arrive, it’s clear that they’ve outdone themselves with gin and revelry, so I rustle up more coffee and pop a bottle of sparkling wine for mimosas. More is more! If you step in my kitchen and politely ask if there’s anything you can do, you’ll likely find yourself mincing garlic, setting the table, or pouring cocktails. Be careful what you wish for. As I’m divvying up little tasks, I grab hold of the frittata pan handle, burn the ever-loving-almighty heavens out of my hand, and somehow manage to not drop the whole mess on the ground. I race my hand under the cold water faucet, someone says something about mustard, someone say something about rubbing a raw potato on a burn, someone else pours me a cocktail. Brunch was divine. No one asked about the praline bacon and I’m going to pretend not to have feelings about that. After everyone leaves in the middle of the afternoon, I look through and edit the photos I captured while prepping and serving the brunch. It’s always hard to style, cook, shoot, and entertain so I’m not sure I’ll have what I need for a blog post, but really, today was more about people than posts. I headed to Cochon for an early birthday dinner for muffin-friend Gabrielle, and before I rush out the door, I gulp another unsweetened cranberry juice with water and a pack of Aloha vitamins. I’m stopped very quickly by a passing Mardi Gras parade, which is just one of many daily reminders that I live in a Disneyland–Las Vegas–Mars hybrid. I make it to Cochon, weary and frazzled, order a Sazerac, and bring myself back to life. I Instagram it, too, because that’s what I do. My friends arrive, order Champagne and exactly everything off the menu. I lose my mind on a plate of ribs, and steal most of Jessica’s husband’s bacon-and-fried-oyster sandwich. Cochon gets a lot of hype in this city and really, it’s earned every bit. After dinner, we head back to Jessica’s house for birthday King Cake and more Champagne, before we all walk down the way to watch a big Mardi Gras parade passing by. I had no idea such a crazy place could feel like home. Whose bright idea was an 8 a.m. flight to the West Coast? For breakfast, I hurry and grab a glass of fresh grapefruit juice, a glass of water, and a Kind Bar for my purse (yes, it has chocolate in it). I work my way through security and buy a bottle of chocolate-coconut water from a suspiciously cheerful young man at the airport store-thing. Chocolate coconut water is like my security blanket at the airport. I always buy one. On the plane, I ugly-sleep my way through what I assume are several spirited drink and snack services. Somewhere along the way, I eat the Kind Bar. My parents and sister pick me up from the airport in Los Angeles. It’s my mom’s birthday and our whole family is together to celebrate. Because I am the hungriest person alive, I suggest that we all stop for lunch at In-N-Out. It’s critical. Every native Californian living far from home knows the intense call of these glorious cheeseburgers. We wait in the drive-through line and decide to take our burgers, bagged up, to Dockweiler Beach to enjoy. I order a cheeseburger with grilled onions, two orders of fries, and a lemonade. I eat one order of fries with a weird amount of ketchup in the car as we drive to the beach, and think about my other container of fries as we park the car and look for some sort of beach blanket in my dad’s trunk. My sister just started an ice cream company in Seattle (called Sweet Lo’s), so she makes my mom an ice-cream cake before we head to a steak dinner at Taylor’s in Los Angeles. Taylor’s is one of those super old-school steakhouses that serves very medium steak. I eat a wedge salad the size of my face, then order fish and chips because obviously I needed more fries. Consider this a cry for help. The restaurant brings my mom a complimentary birthday sundae, we sing awkwardly, and she dives into the ice cream. “It’s green!” High compliment. The bowl is passed to my dad and is never seen with ice cream in it again. Back at my parent’s house, we dive into Lauren’s ice-cream cake which has a chocolate-cookie crust, rich vanilla ice cream, a layer of fudge, and whipped cream. It’s so insanely over-the-top I fall into a blissful dairy coma, and sleep in the trundle bed of my youth. Don’t be jealous. Late for church is not an option. For breakfast, I’m awake and caffeinated, with a shower and black coffee. I have to talk to a lot of church ladies on an empty stomach, which feels rather jarring, but I notice a girl selling Girl Scout Cookies in the church parking lot after service and beeline for her. Four boxes of cookies for $20, and I get to talk to a Girl Scout and eat cookies for breakfast. Sold! Later in the afternoon, I have a quick visit with my photo assistant, Jon. We talk about the brunch book we’re working on this year, and he makes me a cheese plate. I eat the contents of the cheese plate as he puts it together. It includes fancy cheese and olives with a side of potato chips and sour-cream-onion dip. I’m a goner. The cheese plate is paired with blackberry Moscow mules, served extra cold in pint glasses. Just before I leave Jon’s house, I request that he climb a citrus tree and return with as many grapefruits as he can carry. I have a thing for grapefruits. For dinner, my Dad makes a ground-turkey-spaghetti sauce with languishing kale and sautéed red onions. I eat my portion out of a giant salad serving bowl and don’t feel the least bit guilty. I drink a cup of black tea while I edit photos and write a blog post, and just before bed, I open the refrigerator, stand in front of it, and hope for something like cookie dough to appear. Then, I remember all of the Girl Scout Cookies. Those Thin Mints never stood a chance. I’m in the LAX Southwest Airlines terminal at 7 a.m. I stand in quite a line to get a green tea from Starbucks, pick up a war-torn banana and a bottle of water. I eat my banana tucked into a corner, sitting on my carry-on duffel, because I think it’s rude to make other people smell my food on a crowded plane. Obviously, I’m the only person that feels this way. They sell tuna salad in airports. That should be illegal. I’m so out of sorts I forget the chocolate-coconut water. Bad sign. During the flight, the man next to me eats three California Pizza Kitchen salads. Three! He seems to have an endless bag of salad. I mention this because I am jealous. Back in New Orleans, I make a stop at the craft store to buy supplies to make a Mardi Gras King Cake. I impulse-buy a bag of Good & Plenty candies, and eat them in the car on the drive home. At home, I eat slices of cheddar cheese with crackers and a cup of coffee. If no one asks me to join them for a meal, I can be found eating snacks over my kitchen sink. I map out the recipes to bake for the week with a cup of detox tea loaded with raw honey. For dinner, it’s roasted chicken sausage served with a lemony spinach salad and rainbow quinoa with fresh parsley and lots of black pepper. A lot of all the things. Finally, a proper meal. Also, I was sitting down. It’s bake day! I start off with fresh grapefruit juice, a giant glass of water, and three cups of coffee with almond milk. That’s entirely too much coffee. I start by making and photographing jam-swirled baked doughnuts with a chocolate glaze. I sprinkle the doughnuts with heart-shaped sprinkles to ready them for a Valentine’s Day post. After shooting, I take two bites from a doughnut, deem it cool, and set them aside. I’m really excited to make a Mardi Gras King Cake, though I do feel a little bit out of my league. Also, I don’t even know what the little plastic baby inside of a King Cake represents. I really should figure that out before I go talking about it on the Internet. Recipe found (a classic John Besh), adapted (because I can’t leave it alone), and three hours later: cake! I’m not even shy about how proud I am of this cake. I make another pot of coffee, knowing full well I’ve already had too much for one day, slice the King Cake, pour a cup, and sit on the floor next to my styled food scene to eat the cake. I give a lot of food away, and I have a freezer packed full of baked goods, but I always have at least one of whatever I’m making. For dinner, I scramble the egg whites I had left over from making the King Cake, and throw together a salad with just-wrinkling cherry tomatoes, chopped spinach, red onions, red-wine vinegar, olive oil, and tons of salt and pepper. I pour myself a glass of wine and decimate my plate. After dinner, I contemplate walking around the corner to grab a plate of beignets from Café du Monde (for research, of course), but opt instead for a cup of tea and another small slice of King Cake. I think I hear a marching band outside. I should go get beignets.